Why am I suddenly typing in Tamizh? That may be because I have just now finished watching Lingusamy’s Vettai! I never wanted to talk about movies in my blog. Then, I negotiated with myself, why not? After bargaining endlessly, I decided to write about that too. I mean, what is wrong? I am a movie buff yaar…! I went to watch the movie only because Madhavan was in it!!! And I also had faith in the movies that Lingusamy takes and the movies that Arya chooses to be a part of. It is a story of two brothers. The older one, Madhavan, in spite of being a cop, fears everything and the younger one, Arya, is very daring. It shows the transition of the older brother from being timid to being brave. Apart from that, there is love in it. The tolerable one is the last song. Did you notice a pattern? In short, a masala film!! What to do aakhir dil hai Hindustani!! 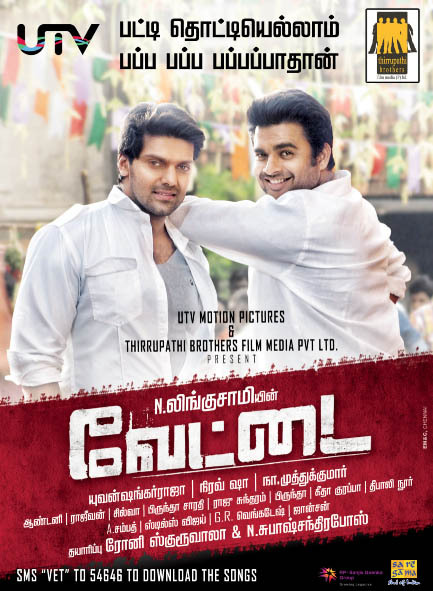 Thumbs up for Lingusamy’s Vettai!